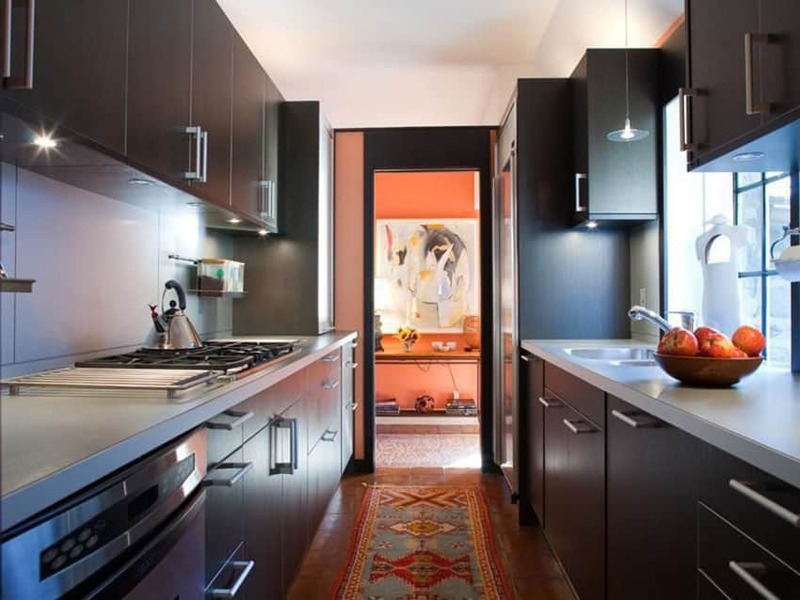 This gallery features beautiful small kitchen ideas from a variety of design styles. These small kitchen decorating pictures showcase different layouts to help you get the right look from a tiny space. The small kitchen shown in the picture above has a refreshing combination of rustic elements and modern transitional style. Cabinets and walls are all white, and it also uses white marble subway tiles for the backsplash for that clean look typical of modern transitional style. The rustic weathered wood beams on the ceiling adds more texture and personality to the space, making it look more interesting. Efficiently using the limited space, this kitchen design focuses on creating sufficient storage space with a good balance of sufficient preparation space. 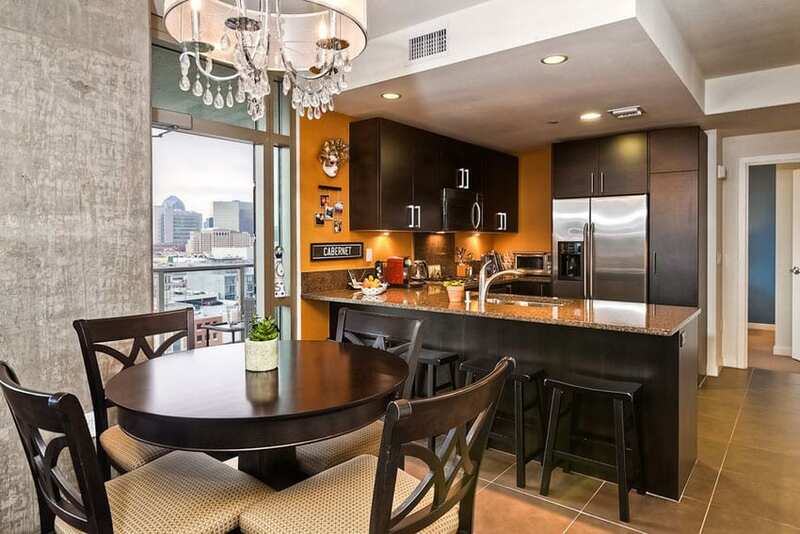 The dark oak veneers look gorgeous on the paneled cabinets and stands out nicely against the light yellow walls. White soapstone counters and white mosaic backspalsh balances gives a clean and bright looking surface to the area as well. 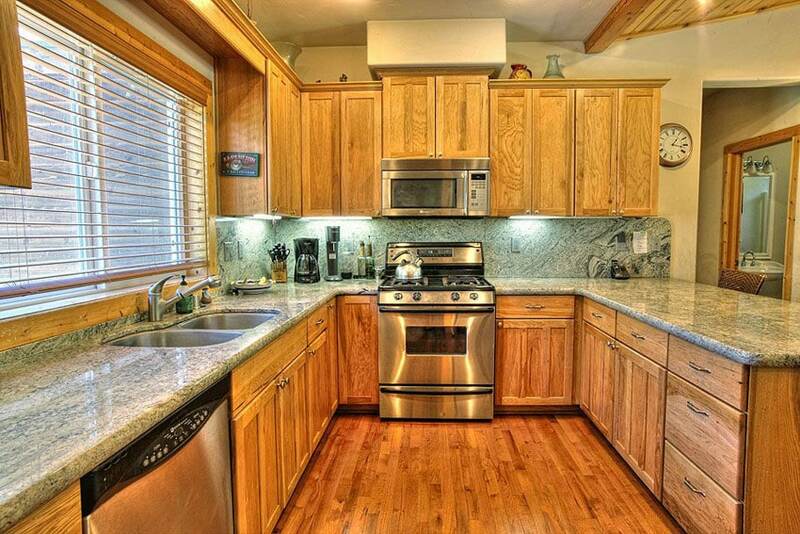 Since the kitchen is U-shaped, one counter also doubles as a bar counter, mostly used for smaller, more casual meals. This modern kitchen injects classic French elements and details into the design to give it that classic and romantic appeal. 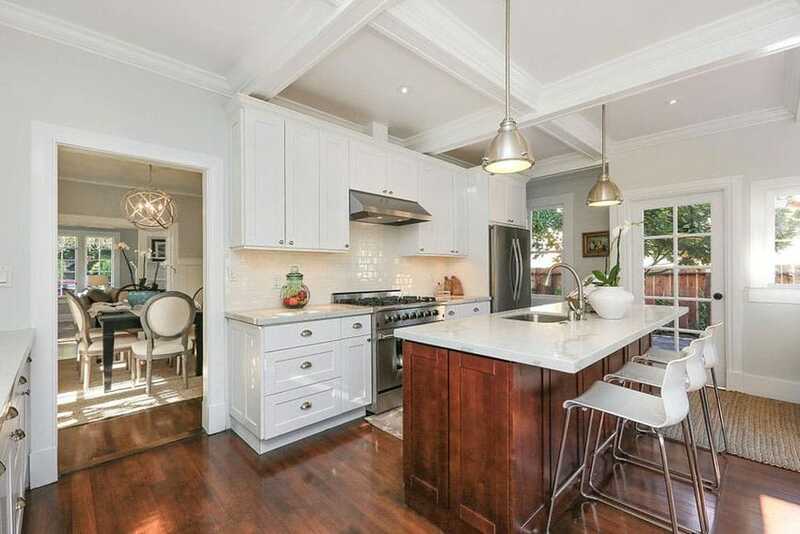 The open layout of the kitchen helps make it look spacious, while the combination of oak wood floors, white walls and light maple ceiling gives a very unique variety of finishes to the space. The cabinets are modular, with a simple panel design, and are all finished in a light gray color and topped with white solid surface. To add a little flair, small details like turned leg posts for the kitchen island, wrought iron chandelier and antique French barstools on the other hand make the space look more chic and sophisticated. Simple yet refreshing, this small kitchen has the right balance of cool and warm colors. Light walnut floors are paired with light sage green walls with white moldings to create the fresh backdrop, which is a nice contrast against the red tones of the Mahogany kitchen cabinets. 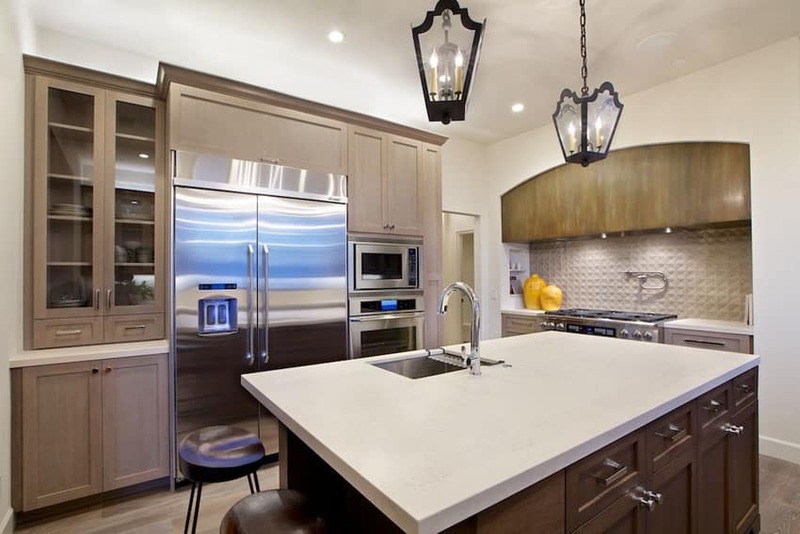 Light cream stone tiles were used for the backsplash, and a similar color tone was selected for the quartz countertop. 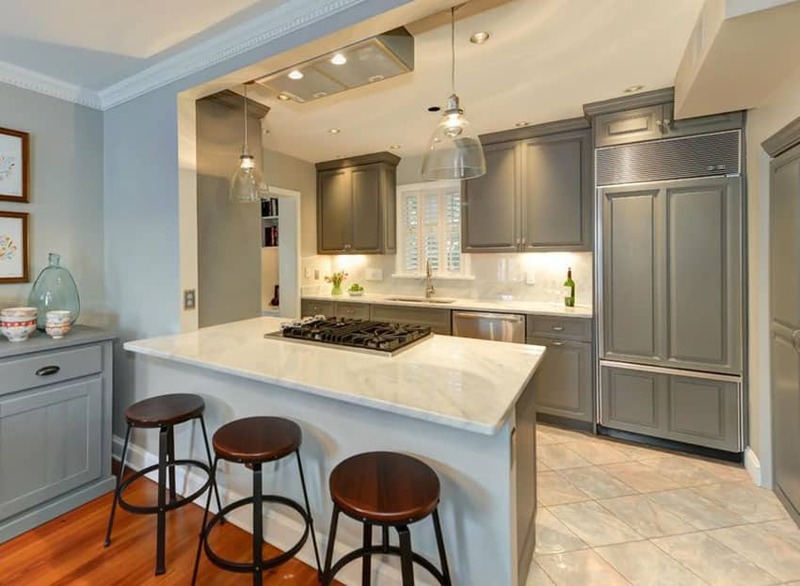 Classic paneled kitchen cabinets are given a fresh modern look with a simple gray paint finish. The soft matte finish looks great and is very gender-neutral, making it pleasing to look at whatever color preference. To balance the dark and cool undertone of the cabients, white marble was used for the countertop and backsplash, with additional help from warm lights. Tucked in a small corner of the home, this kitchen may be small, but is not lacking in functionality and style. You will see the play on different textures in this space, mostly using grungy textures/patterns to create an industrial look. 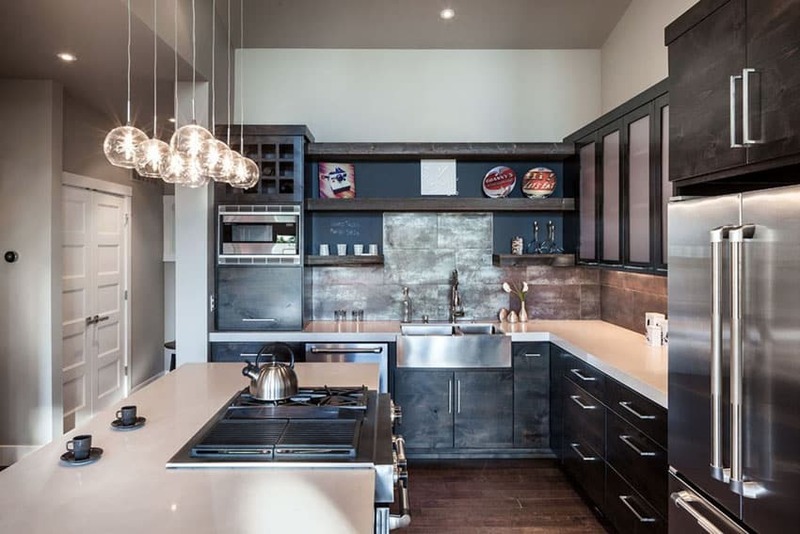 The kitchen cabinets uses laminates which has a dark weathered oak finish to give that grungy texture and contrasts it with smooth white solid surface counters and stainless steel sink. 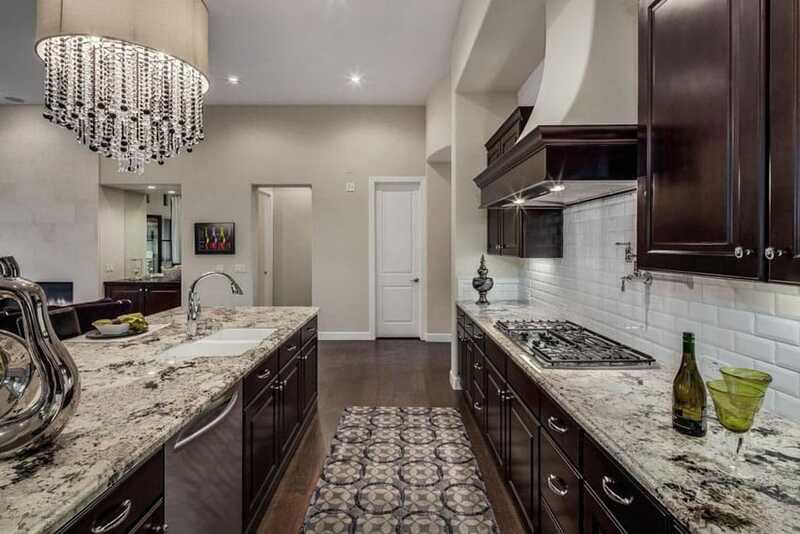 On the other hand, the metallic ceramic tiles used on the backsplash seems to match the finish of the cabinets. One unique element of this kitchen would be the black board used as backing for the open overhead shelves. When coming up with small kitchen ideas the primary factor is available space. 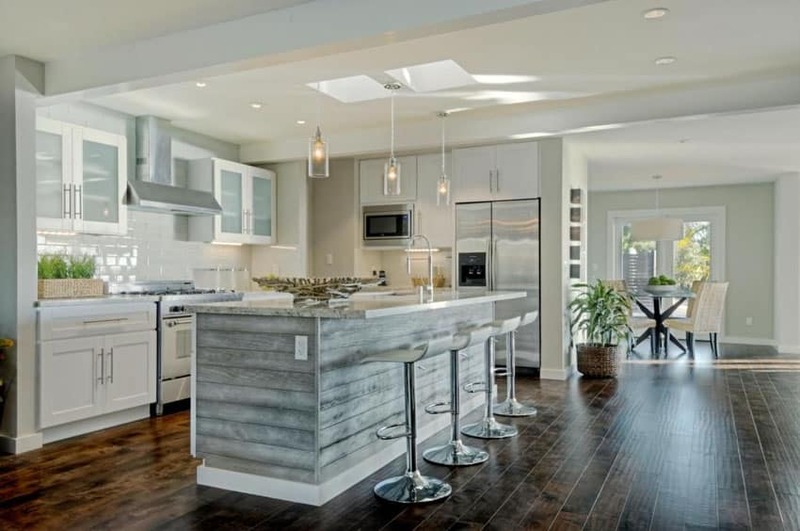 Here are some examples of how small kitchens are implementing islands in their layouts to provide extra space for food preparation, storage and dining. A simple yet pleasing combination of three colors/finishes is what makes this kitchen design look really simple yet classy. Floors are black-painted wood, while the walls, ceiling and the entire cabinetry are all finished in matte white paint. To add a bit of subtle warmth into the color palette, a light maple wood movable island counter was placed in the middle, along with matching bar stools with woven rush seats. Coupled with warm white lights, the kitchen achieves a rather pleasing ambiance to it. This modern rustic kitchen space is a bit busy with its various colors and finishes, giving it a shabby chic vibe while maintaining that modern streamlined look. 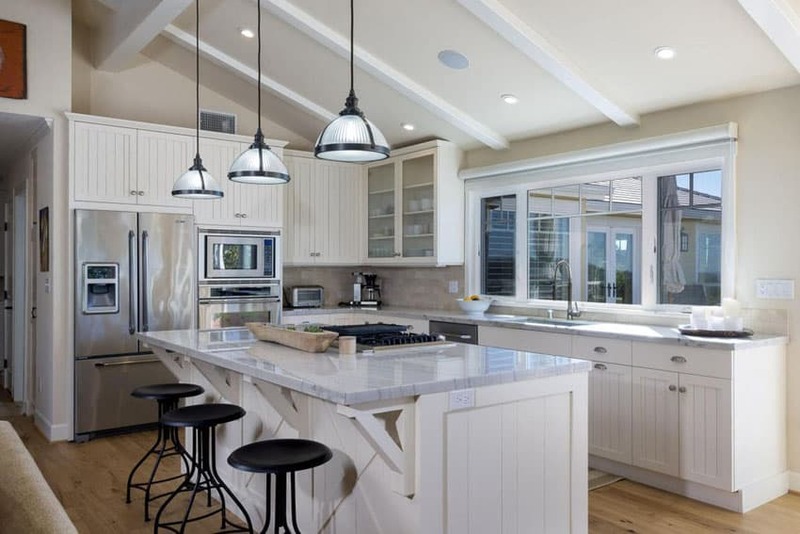 You will see that most of the walls and cabinets are painted in an off-white color, while the ceiling clad in wood slats are painted in light gray, matching the base of the kitchen island with white solid surface top. There’s really much variety when it comes to the finishes in this space: natural stone floors, solid rustic wood bar stools, stainless steel mosaic backsplash, printed fabrics and gold pendant lamps, to name a few. Despite the compact size of this kitchen, it does not go short on style. With modern silhouettes and rustic inspiration, it combines that streamlined look with rough, rustic finishes to add more personality to the space. For this kitchen with white walls and solid pine wood floors, the finish of the cabinet is quite unique. Instead of more popular wood or plain-colored laminates, it uses rustic metal finish laminates instead, in a dark rusty gray color. To balance out that dark color, the countertop used is plain white solid surface Thassos quartz paired with sage green glass backsplash tiles. There is also a large kitchen island with white sold surface top and sides, and a face clad with rustic wood finish vinyl. To match the look of the kitchen, metal bartstools were used and is accentuated with blown glass pendant lamps. A modern transitional kitchen with a classic flair – simple white paneled cabinets paired gray subway tiles and gray quartz counters. 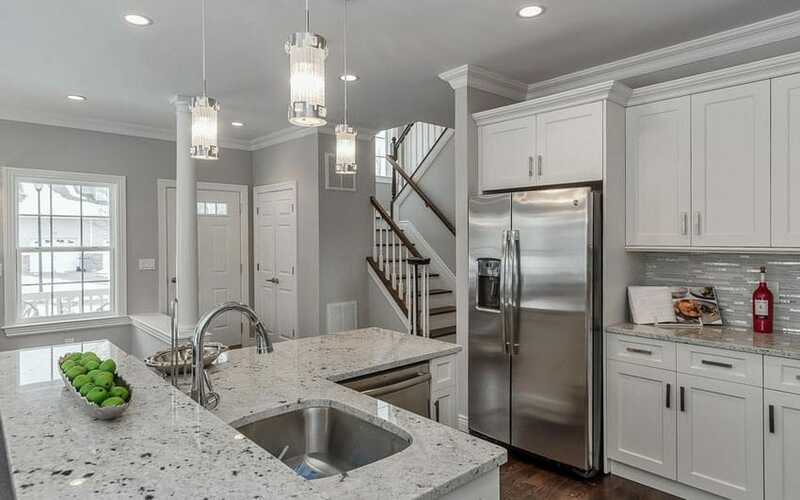 Walls are also light gray, matching the finish of the kitchen island base. Adding a classic touch to this otherwise modern space is the wrought iron pendant lamps which is a minute detail, but does a lot in setting the over-all feel of the space. Despite its smaller size, this kitchen still looks bright and airy because it adapts an open layout, making it look more spacious. Adapting a modern transitional style, this kitchen combines simplified panel cabinets with modern colors and finishes. The interior finishes are fairly basic: solid oak floors, off-white walls and plain white ceiling. For the kitchen cabinets, it combines 3 finishes: White paint, dark wengue and ash for the kitchen island.The uniform use of beige quartz counters helps make the look more coordinated as well. 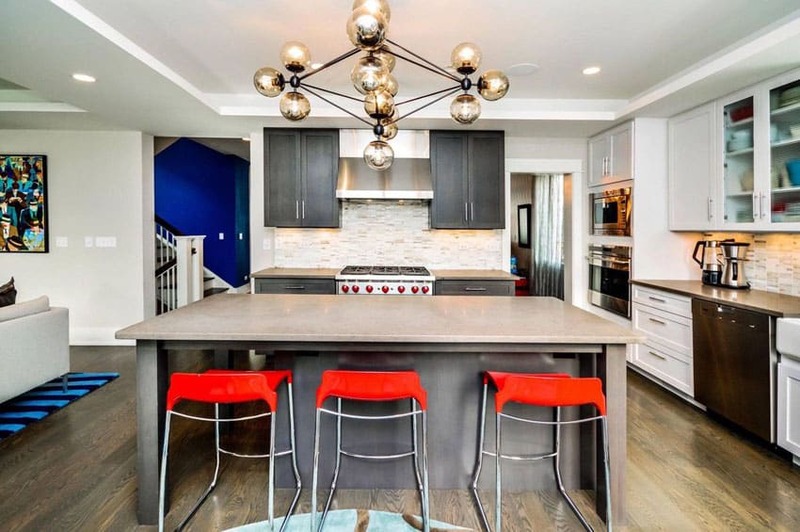 The focal point of this design is definitely the kitchen island in which there’s a unique blown glass chandelier hanging right above and 3 red modern bar stools. A glamorous kitchen design combining a minimalist color scheme with an interesting combination of textures. The architectural finishes were kept basic: white floors and ceiling combined with gray walls, to provide a flexible base for the design. 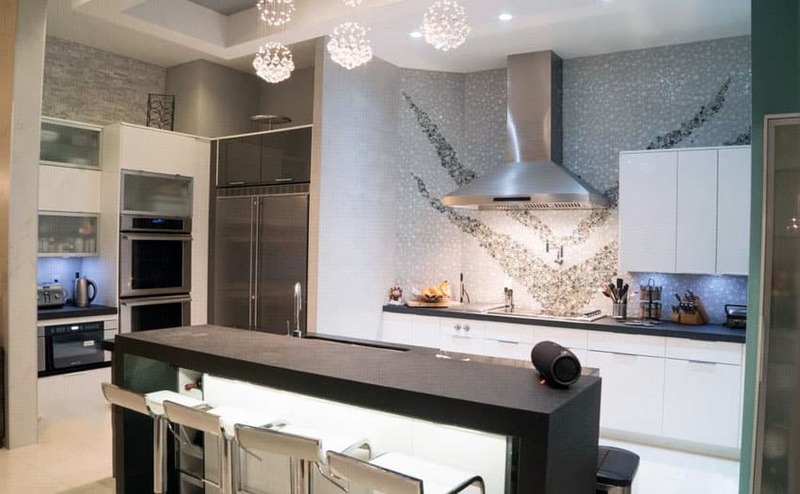 The most interesting feature of this design would be the custom mosaic tile wall which has a unique design made from glass mosaic tiles in different sizes, which produces a crystal-like effect. Because of the busy backsplash wall design, the cabinets goes for a simpler approach, using white laminated cabinets with matte black countertop for a simple and modern look. 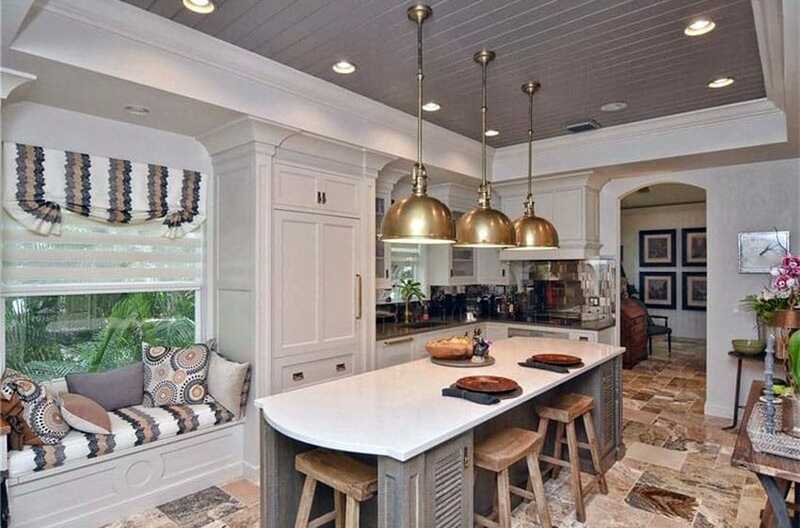 The kitchen island / bar area is also the same, and simply adds crystal pendant lights for added glamorous effect. Small, limited spaces should not be a reason to fear using dark colors, and this kitchen is a good example. With the right combination and composition, you will still be able to produce great results. For this example, you will see that the kitchen space is limited, but it uses an open layout and large window/door openings to compensate the size and make it look spacious. 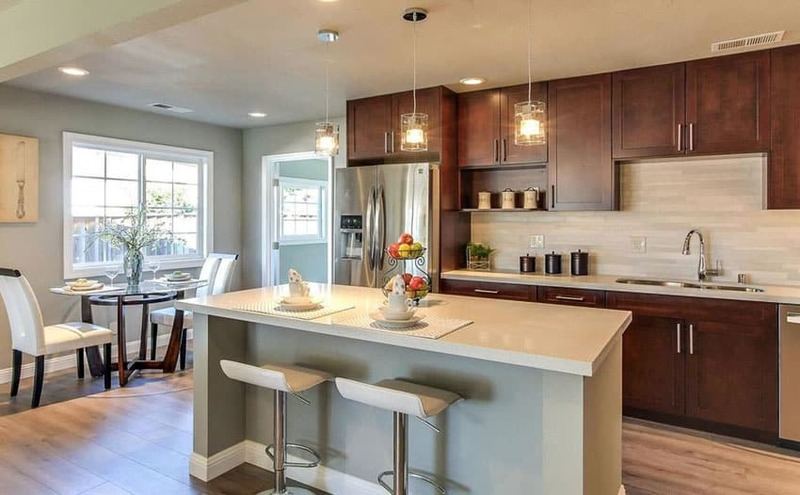 Walls and floors keeps basic light colors as well to balance out the black laminates used on all the kitchen cabinets and countertop. Adding to the unique look of this kitchen would the maple wood edgings on the cabinets and the solid maple beams on the ceiling and mazama wood floors creating a subtly coordinated look on this modern design. An impressive satin nickel 7 light chandelier is supended above the kitchen island. Because the flooring of the space is very dark and bold, the kitchen design helps tone it down buy using mostly white for its finishes. 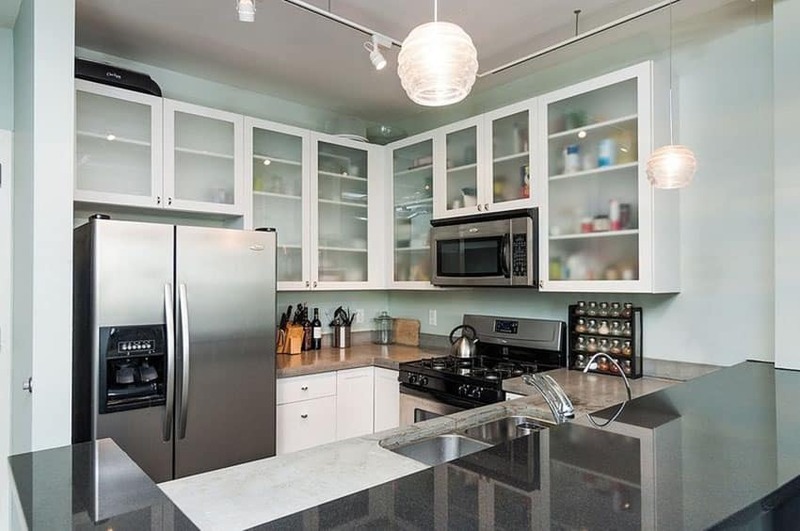 Main cabinets are all white, topped with white granite and paired with white subway tiles. The kitchen island on the other hand, uses weather ash wood panelings and tops it with dirty beige granite for its counter. Because of the white color, it easily blends into any interior or furniture style, making it very flexible & stylish. Modern minimalist kitchen design tend to use only 1 to 3 colors in its color scheme, and this one is a good example. Modular cabinets are all laminated in perfect black, while its countertop surfaces uses a combination of white quartz and gray quartz. 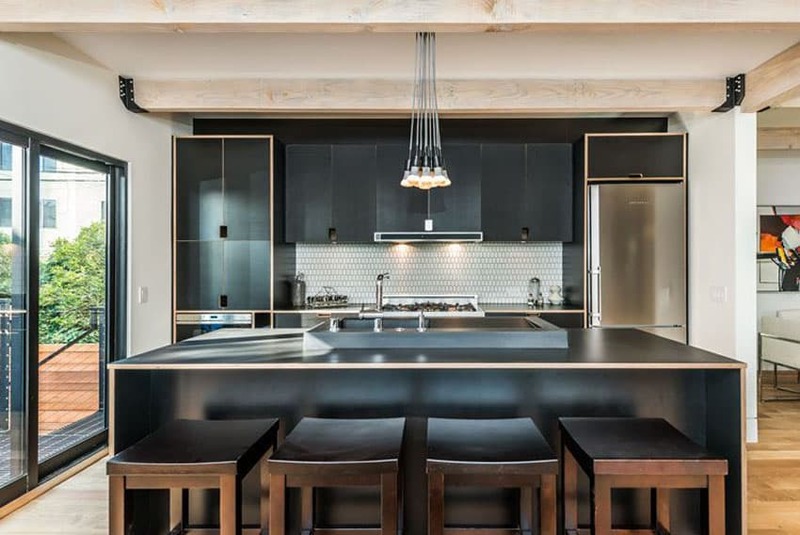 Metal bar stools are also black, while the wood cladding on the columns help add warmth and texture to the kitchen, as well as conceal wiring and other electrical components. Your small kitchen layout should be configured in a way for maximum functionality and style. Positioning appliances and cabinets opposite of each other and opting for full height cabinets are both great ways to get the most out of an area with limited space. Placed in a small corner of the room, this semi-open kitchen is able to maximize available space for both storage and a sufficient preparation area. Paneled cabinets are painted in a gray color and topped with faux marble laminates for the counters and a white and gray mosaic backsplash. To create a cozy feel to the space, warm white light was used. This U-shaped kitchen also has a small bar counter surface for small quick meals. White combined with light colored wood finishes produces a very light yet warm atmosphere in any space. It also makes for a very timeless look and is easily accessorized due to the neutrality of the palette. This is one such example. 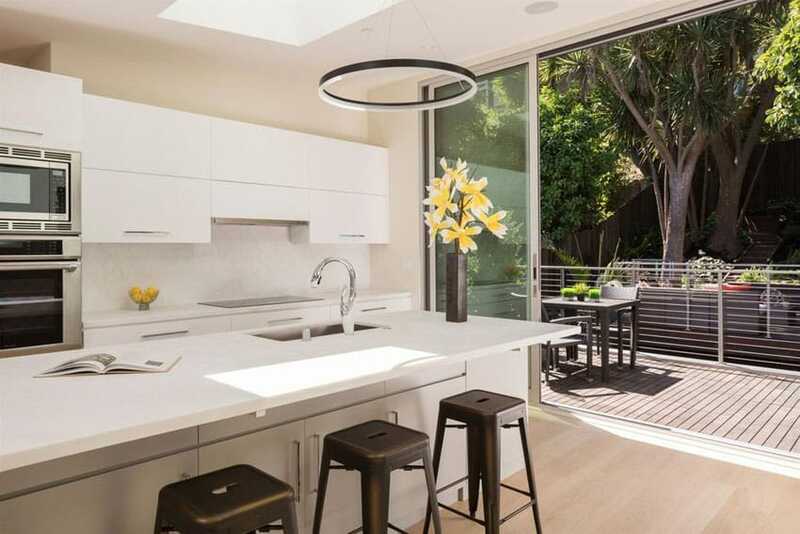 The small L-shaped kitchen has all-white cabinets and uses white marble for its countertop and backsplash. Clean hard edges combined with seamless finishes typical of modern designs is what this kitchen is composed of. 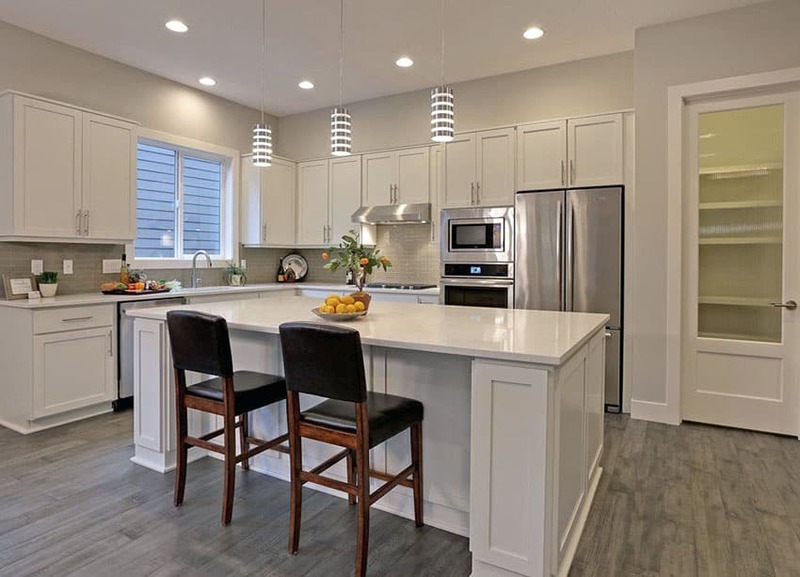 Light maple engineered wood floors and light gray walls offers a light and neutral background for the the whole kitchen, which makes selecting a color scheme for the kitchen a little easier. 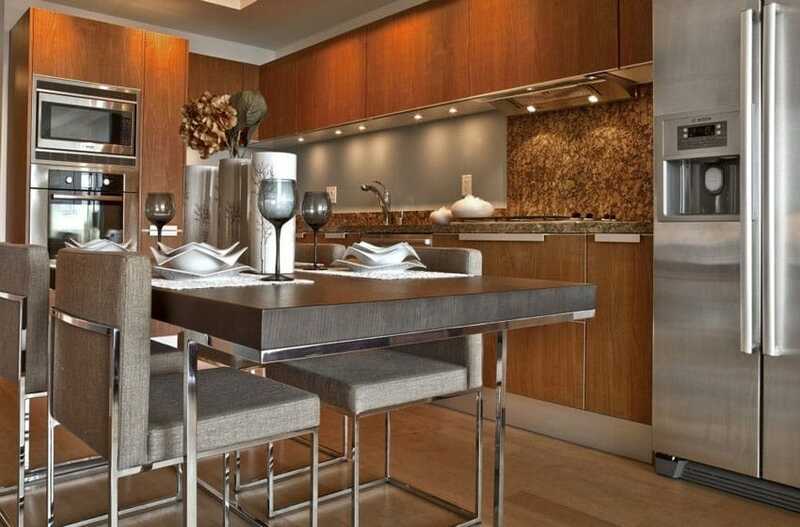 For this design, natural earthy tones are favored, using teak wood laminates for the cabinets and golden brown granite for both the countertop and backsplash. True to its modern design aesthetic, it also uses a combination of aluminum and stainless steel finishes, as well as the use of LED lighting to enhance the ambiance of the space. Brushed stainless steel countertops adds a very modern look to this small kitchen despite its use of paneled kitchen cabinets. The stainless steel counters provide a hygienic, easy to maintain and smooth surface for food preparation, which makes it a very functional design aspect of the kitchen. The combination of gray cabinets and black smaller elements gives a subtle contrast and variety to the finishes as well. For tight spaces, simple is best, and this kitchen offers a good demonstration of that concept. 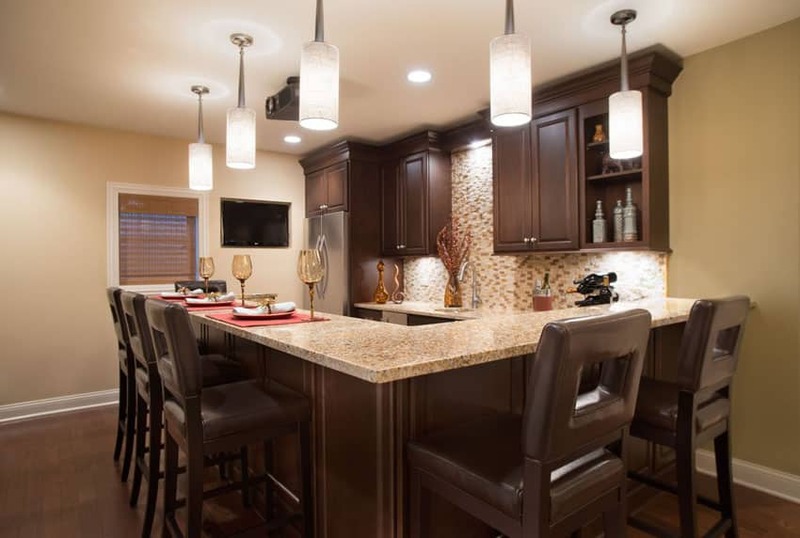 Simple white walls with no moldings or additional decor, plain white cabinets with frosted glass doors on its overhead cabinets and tops it with a gorgeous light beige natural stone with an additional bar counter using Arabian black granite. Minimally decorated with 2 pendant lamps, this small kitchen delivers function and a timeless style. This kitchen is considerably spacious mainly due to its very generous ceiling height, making it look bigger.Additionally, this kitchen also opted for a lighter color scheme, making it look extra refreshing and spacious. 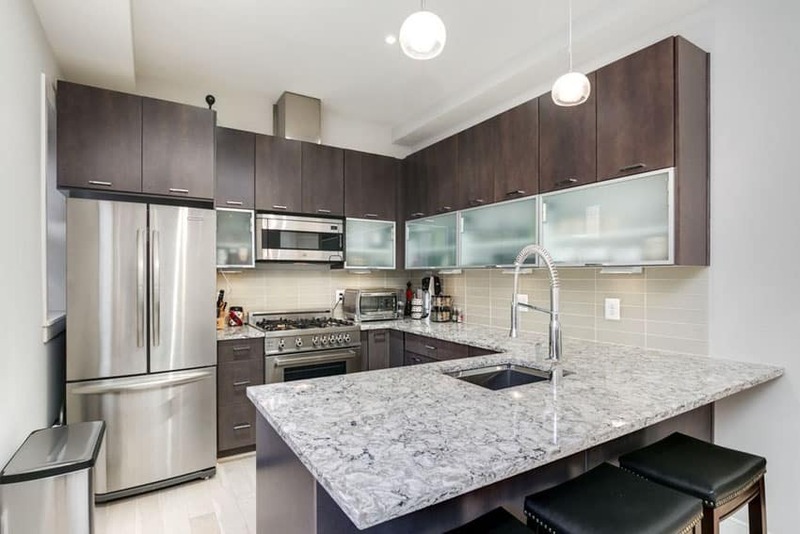 For the cabinets, a combination of glossy white laminates and maple laminates was used, while the countertop & backsplash uses marble finish solid surface to achieve that elegant look of marble, but retain a seamless finish. To add a bit more depth and color to the space. the lights used are warm white to give it a little more warm tone. This small modern kitchen combines wood finishes with sleek modern finish to create this unique look. The dark walnut laminates of the overhead cabinets were combined with metal-framed frosted glass, helping you easily identify the contents of each door whilst hiding it from view as well because of the glass frosting. Since the laminate of choice is dark, a soapstone with light gray markings was used for the countertop and light beige ceramic tiles for the backsplash. Tucked in a bright corner of the room, this French style classic kitchen is elegant, functional and simple. The room offers a very pleasing background finish of light yellow with solid mahogany floors, setting a subtle warm ambiance. 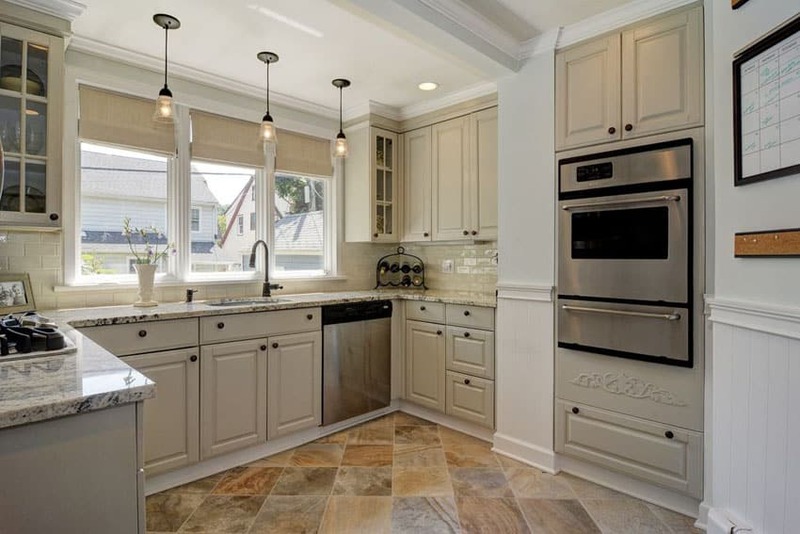 For the kitchen cabinets, French style cabinetry was used and finishes it with white to match the doors, windows and moldings, while the granite counter was light beige to match the yellow tone of the walls. Despite being small, this kitchen manages to look elegant and classy with its beautiful choice of colors and finishes. Paneled kitchen cabinets are all solid Mahogany and has a nice satin finish, giving it a subtle sheen without being overly glossy. The backsplash mosaic tiles and the Giallo Fantasia granite counters uses the same color tones of beige and golden orange to make them look coordinated. 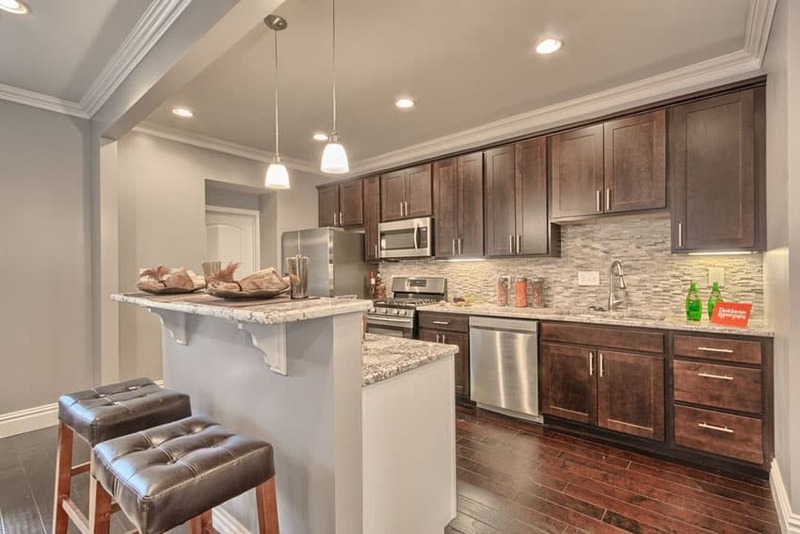 Due to the limited space, the L part of the U-shaped kitchen doubles as bar counters, and therefore uses a matching mahogany-framed bar stools with brown leather upholstery. A simple gallery kitchen with very limited space maximizes its available wall areas for storage. Due to the limited space, modern modular cabinets is the ideal choice. 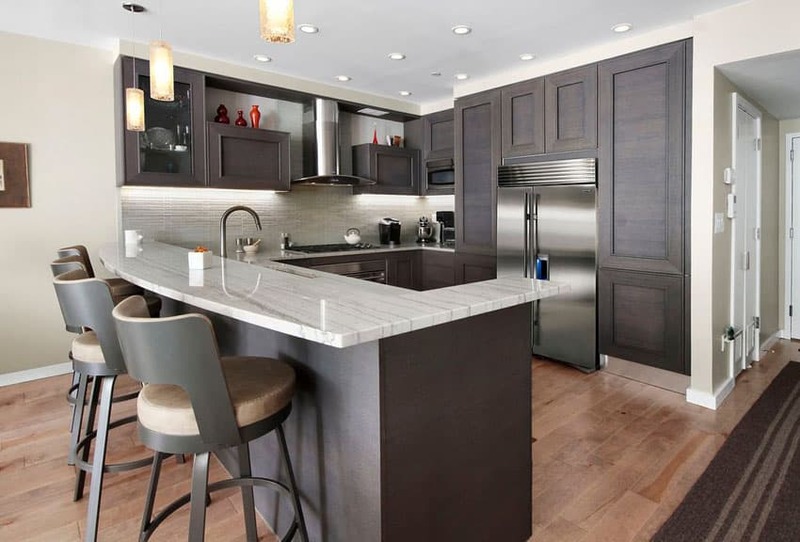 This example in particular uses dark oak laminates for its cabinets combined with light gray solid surface counters, creating a pleasing contrast of colors and a clean modern look. Adding a touch of color to the space is the printed rug on the floors, adding a small splash of reds and oranges to the space. With a combination of grays and whites, this modern kitchen space evokes a masculine vibe, perfect for industrial style spaces or midcentry modern spaces. Contrast is the key for this space: ebony wood floors, light gray walls, and a similar combination for the cabinets which is black cabinets paired with Calacatta Carrara marble counters. Due to the limited space, the kitchen island not only serves as an additional preparation area, but also functions as a dining table as well. Scandinavian style barstools with gray fabric upholstery was used as seating and the mood is set with 3 industrial Edison style cage pendant lights. One of the ways a small place can be made to look bigger is through color. Painting your small kitchen cabinets white or another light reflecting color can help give the appearance of looking bigger. Another tip is to remove the doors from some of the cabinets or install glass doors which will give the impression of a larger space. This small kitchen has a cute retro look with its choice of colors, finishes and even hardware. 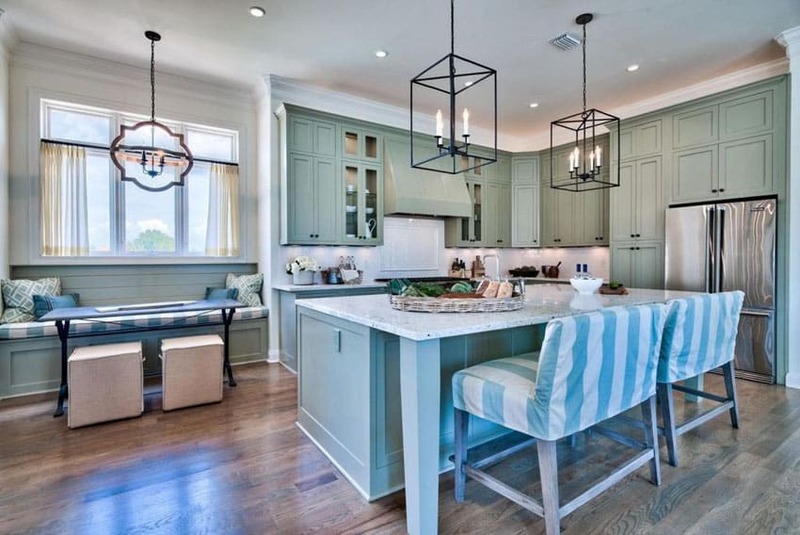 The quaint kitchen uses 2 colors for its kitchen cabinets, a forest green color for base cabinets, and white for the overhead. The main cabinets uses black granite for the counters while the kitchen island uses white soapstone for a softer look. The backsplash uses hexagonal mosaic marble giving the classic material a modern update. For the lighting, retro metal pendant lamps were used, which looks perfect with the metal barstools used. Sometimes, basic colors and finishes work best for smaller spaces, and this one is a good example. While the walls are painted in a warm of-white color, the floors uses solid Teak wood which has a bold orange color, creating a really strong look. So the kitchen cabinets helps tone it down, using matte white finish to the simple paneled cabinets. 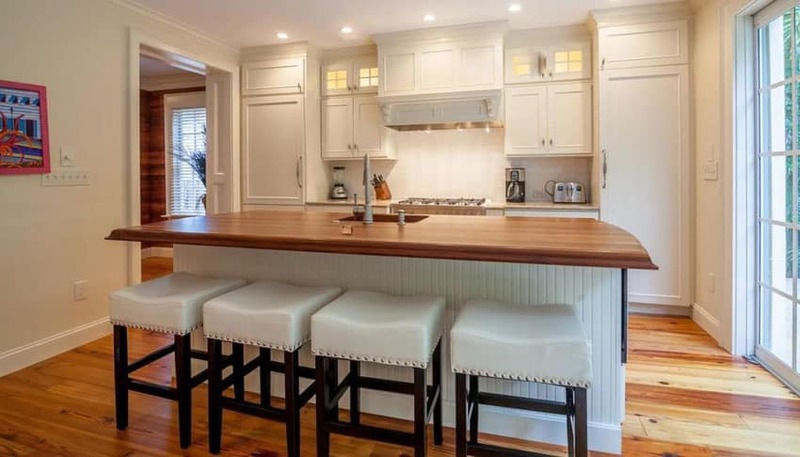 Adding a subtle variety for this would be the Mahogany butcher’s block countertop used on the kitchen island, and the wengue finish of the barstool legs. 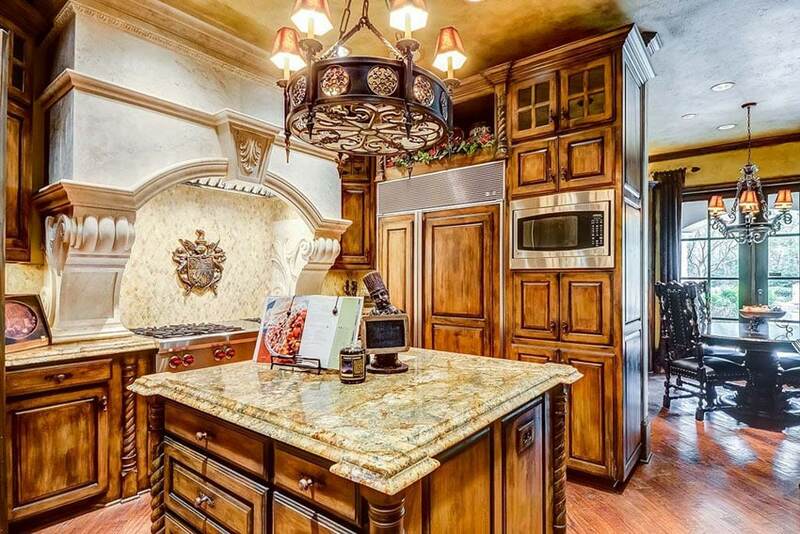 A true classic Spanish style kitchen with detailed and intricate elements and motifs. Kitchen cabinets are all made of solid walnut, with paneled design and turned wood details for that true classic Spanish look. The warm walnut cabinets are complemented by the gold granite counters and the warm light from the wrought iron chandelier. Warm tones dominate this small kitchen space, consistently using Teak wood on both floors and kitchen cabinets. The result is a polished rustic look, with clean strain lines and glossy finishes. Because most of the room already uses warm toned colors, the countertop and backsplash material used has a cooler color. The emerald green Juparana Vyara granite counter is a refreshing contrast to the warm tones of the teak wood, and gives a nice balance of colors. 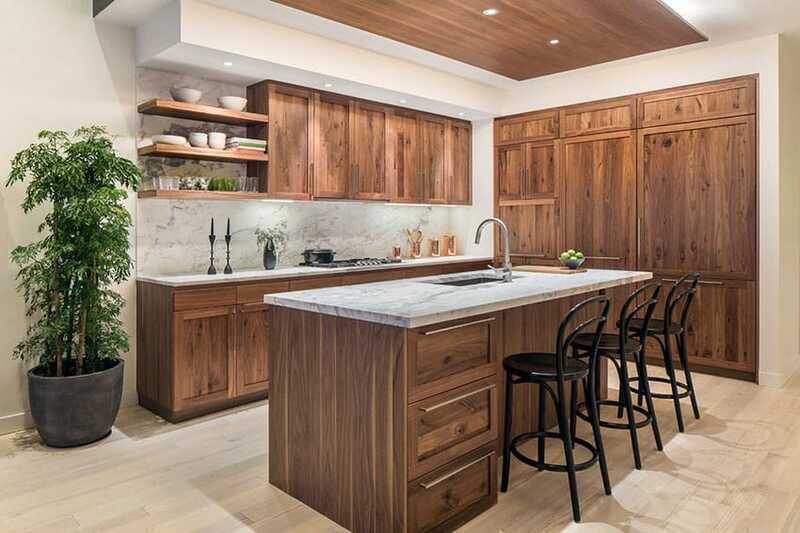 For soft and warm look, wood finishes used in this kitchen are of lighter color and have soft grain patterns instead of thick & prominent grains. There are 3 wood finishes used namely light maple, fruitwood and light mahogany. Complementing these are Bora Bora white quartz solid surface counters for a clean surface, as well as white 3D tiles for the backsplash for additional texture. Exuding warmth typical of classic kitchens, this example bring a balance of elegance and simplicity in this design. Warm tones are definitely favored all throughout this design. Walls are yellow and floors are Venetian Gold granite. For the paneled kitchen cabinets, solid teak wood was used with matching stainless steel hardware and classic plant motifs for additional details. Limited space is maximized thanks to the modular systems cabinets used in this modern minimalist kitchen. It adapts an achromatic scheme for that ultra modern appeal, and combines different finishes. The walls of the whole kitchen was clad with white glass subway tiles, giving it a unique glassy quality and a subtle pattern. All cabinets uses white laminates, while the countertop material of choice is black quartz to make it contrast with the other light colored surfaces. 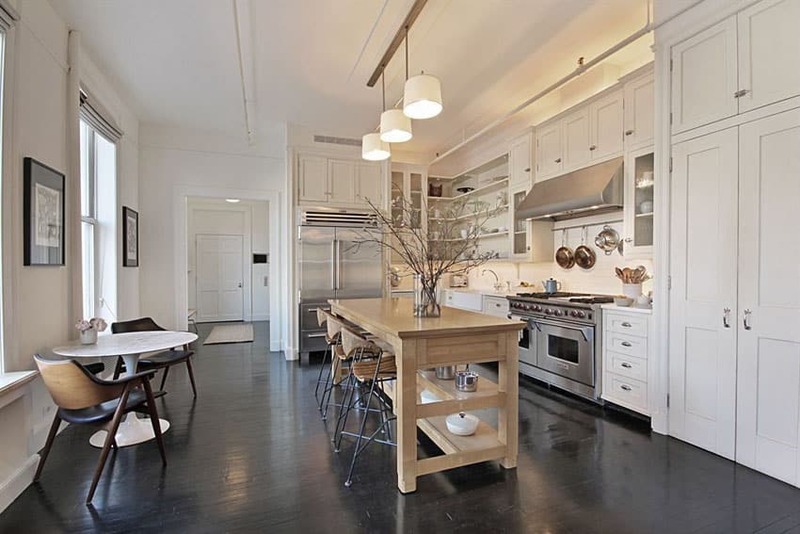 This interior ha a considerable large floor space, however, the space dedicated for the kitchen is very limited. In cases like this, simple is best, so a modern design aesthetic was applied in order to achieve an aesthetically pleasing space which is functional and able to maximize space. 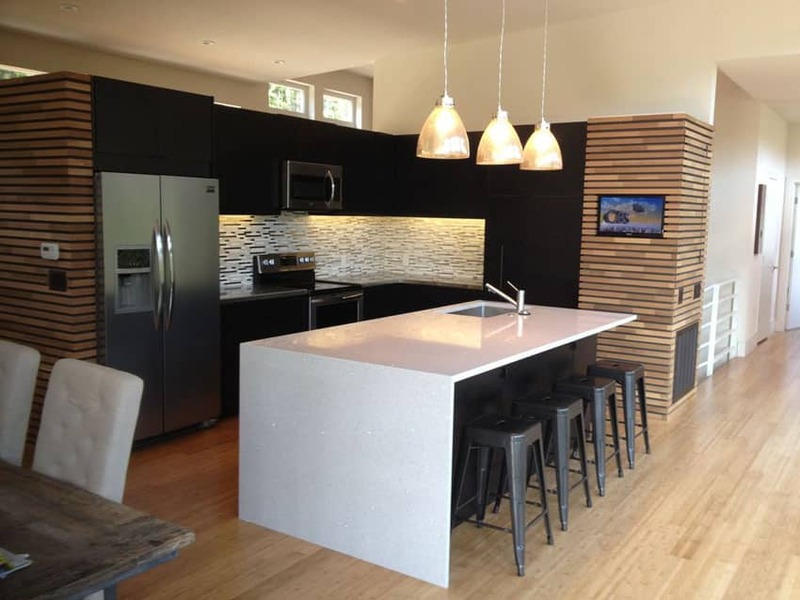 Modular cabinets with matte black laminates were used and topped with white marble and backsplash for a hint of classic. 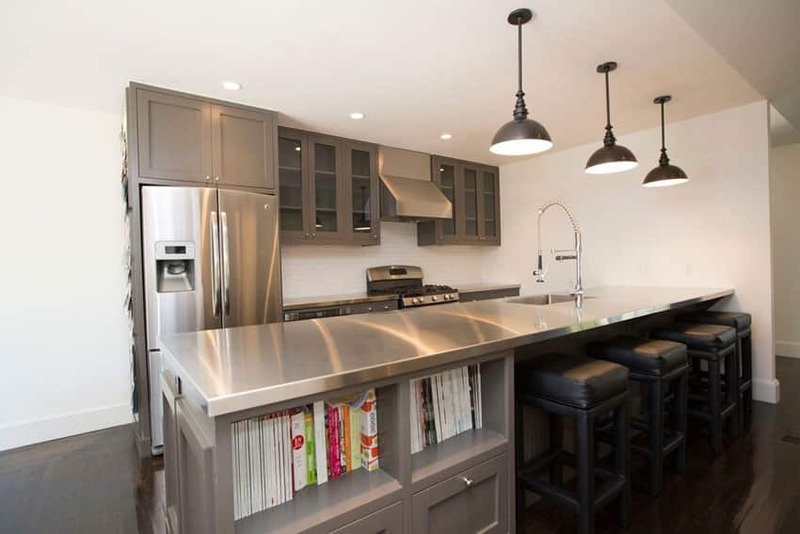 Stainless steel was also liberally used through this design – a full stainless steel movable kitchen island and wall cladding for the cooking area. The color and material choice for this kitchen could be a little too “cold”, but the solid maple wood floors helps add warmth and a natural texture to the space in a very subtle way. Large windows help illuminate this small enclosed kitchen area, and helps make it look bright despite the very limited space. White walls serve as a good background for the light cream-painted paneled cabinet doors which were paired with white granite and cream subway tiles for the backsplash. With bright orange paint for walls, this kitchen would definitely be focal point of this room. The space adapts an open layout, but the kitchen area delineates itself from the rest of the room with its bright wall color and a ceiling drop, emphasizing the outline of the space. Due to the limited floor area, kitchen cabinets were kept simple – dark mahogany laminates with dark brown granite countertop. It was able to allow space for a small bar counter area and has enough storage and preparation areas. 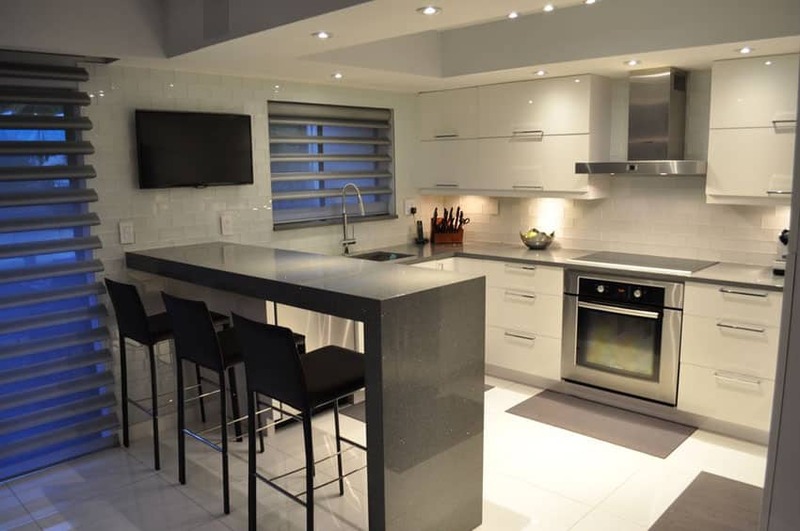 This kitchen adheres to the basic color scheme of the house which is light gray and white. 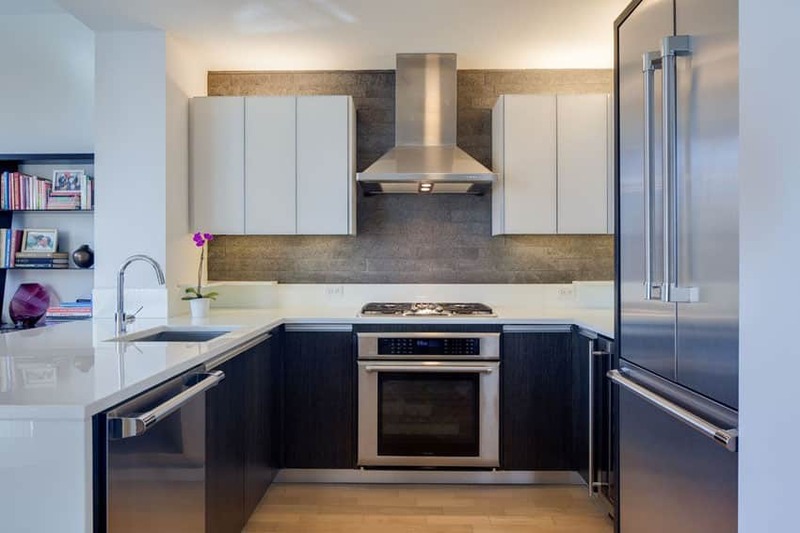 It uses simple paneled doors in white paint finish, combined with white granite countertop and a unique gray and silver mosaic tiles for its backsplash which not only adds texture to the surface, but also a unique metallic shine. These cabinets were finished in dark oak to create the textured effect on the kitchen cabinets. The choice of finish is a little dark and bold, but the light gray walls and moldings helps balance everything out. Additionally, this kitchen also uses white granite and mosaic stone tiles with very prominent texture to add more personality to the space. A simple modern kitchen set-up perfect for small spaces with open layouts. This kitchen features modular cabinets laminated in walnut for the nice golden undertone and prominent wood grains which adds to the warmth and personality to the space. For the countertop, white solid surface keeps the surface clean, simple and seamless, perfect for its modern theme. Quaint yet lovely, this kitchen oozes with style and personality with its combination of finishes and elements. 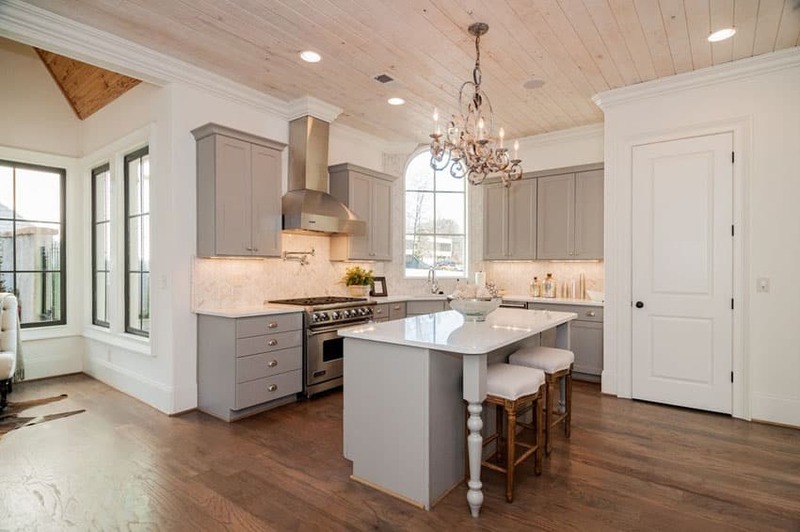 Simple version of paneled cabinets were used and finished in plain matte colors – white for the overhead cabinets and light gray for the base cabinets. 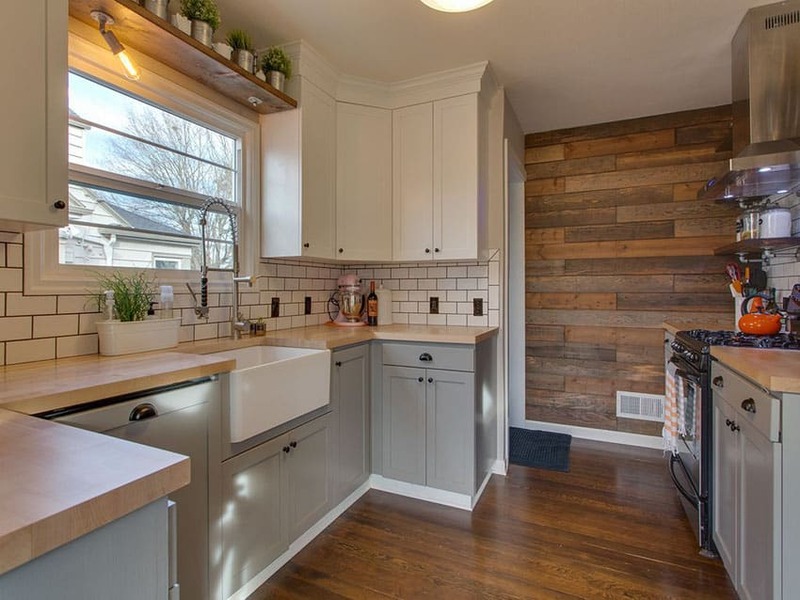 The light color of the solid maple butcher’s block countertop adds a soft and subtle warmth to the surface, and looks lovely with the white subway tiles on the backsplash. Another interesting feature of the kitchen is the gorgeous accent wall clad with reclaimed wood, giving it a nice rustic look. Another modern kitchen design which effectively combines plain finishes with textured finishes to create a pleasing and balanced design. The modular base cabinets applied textured wengue wood finish, while its overhead cabinets uses plain white laminates with under grab for a clean minimalist look. The solid surface countertop looks perfectly seamless and glossy which contrasts the concrete textured backsplash tiles. Fans of Scandinavian style interiors will definitely fall for this minimalist kitchen. It has an open layout and a very simple color scheme which will definitely look great in pictures. White walls with light teak wood floors and pale walnut wood slats on the ceiling serves as the base for the all-white kitchen. 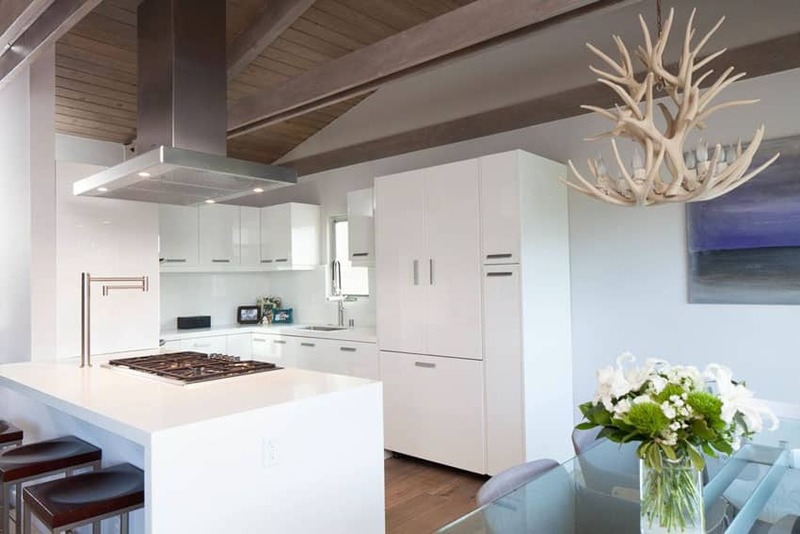 The modular cabinets were laminated in glossy white and topped with white solid surfaces for that ultimate modern look matching the Mid-century modern interior. Following a simple version of classic kitchen design, this kitchen manages to create a simple yet elegant kitchen design which perfect maximizes the space and matches the style of the other parts of the house. Kitchen cabinets are all white and is topped with white quartz and paired with white subway tiles. 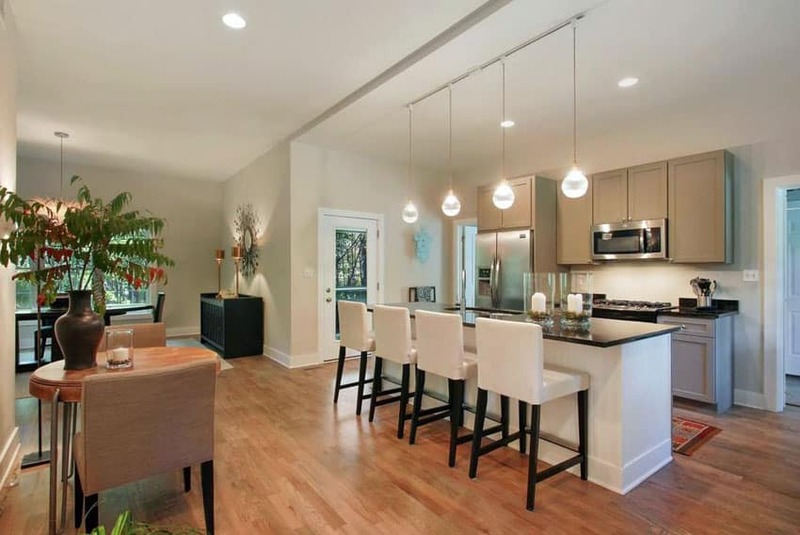 The cabinets stands out against the solid cherry wood floors well. The kitchen island also uses the same wood as the floors and topped with white marble for a nice contrast. 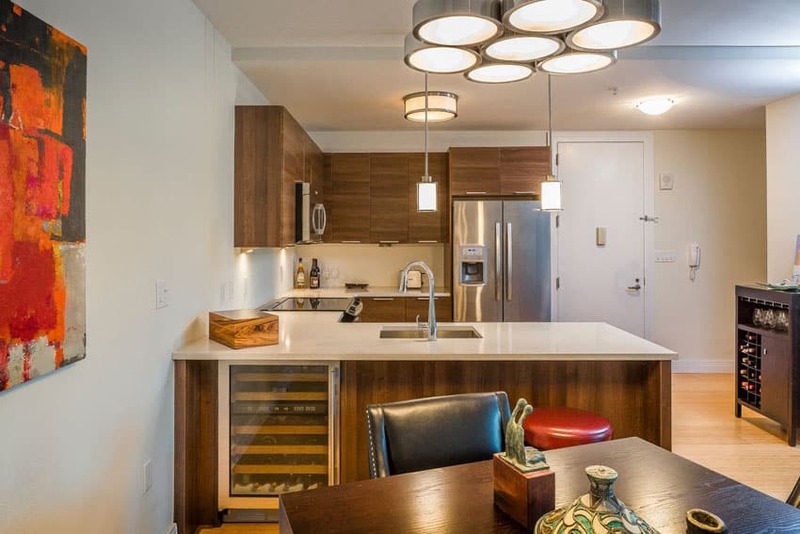 Other elements include white molded plastic chairs and retro style stainless steel pendant lamps. 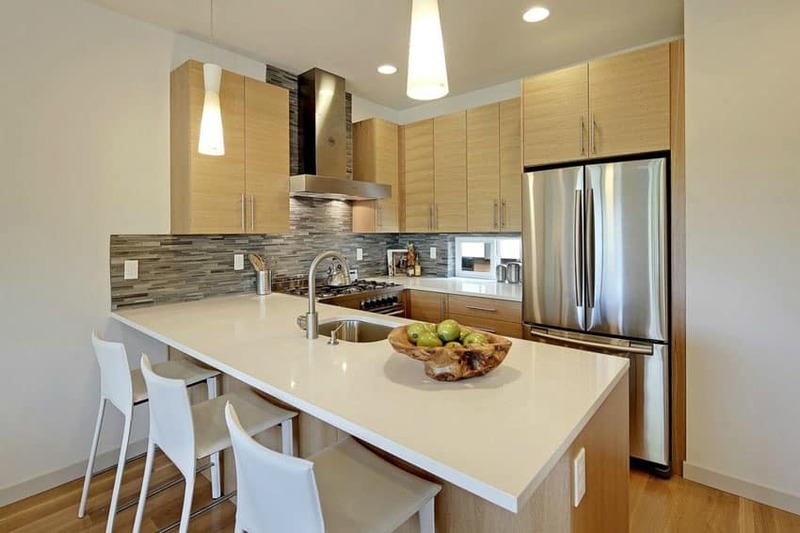 Another ultra modern kitchen ensemble which uses an all-white color scheme. This kitchen directly connects to a balcony through a large sliding door which helps provide lots of natural light into the small space. The walls are painted off-white while the floors are light maple for a soft and warm look. The cabinets are modular and laminated in white, topped with white marble to give that perfectly clean looking kitchen space. This kitchen combines classic design sensibilities with modern finishing for a more updated feel. 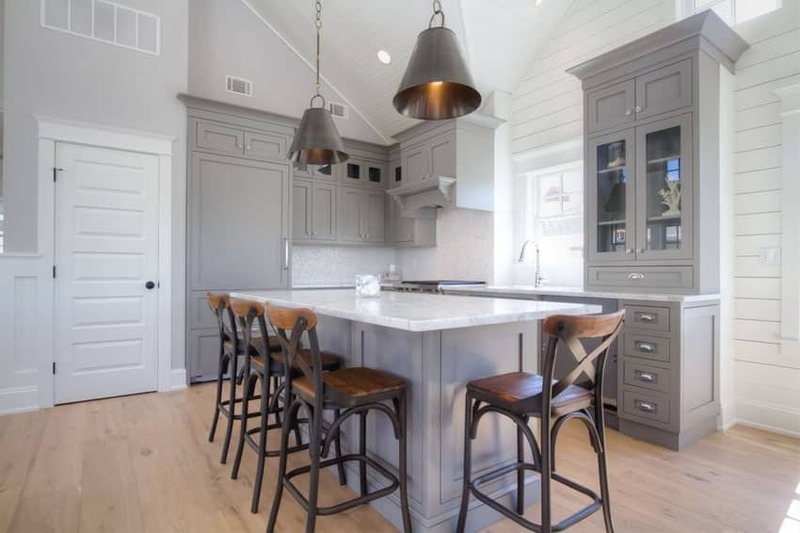 It follows the colors scheme of the rest of the house which is white and light gray, but uses 1 shade darker gray for the kitchen cabinet finish. These gray cabinets are paired with white marble with flat nosing and white mosaic tiles with a pearly sheen to it, adding a unique texture to the wall surface. The kitchen island also serves as a breakfast table, with rattan-framed barstools in dark wengue and teak wood finish. The use of vertical slats and cross slats gives this simple kitchen that country barn feel, but is given a modern update by topping it with a creamy light yellow paint color to match the soft color of the walls. The result is an elegant and classic-looking kitchen space which looks unique and is very functional. These kitchen cabinets are topped with light gray soapstone, giving it a very soft and subtle color. Even tiny spaces can have serious style. 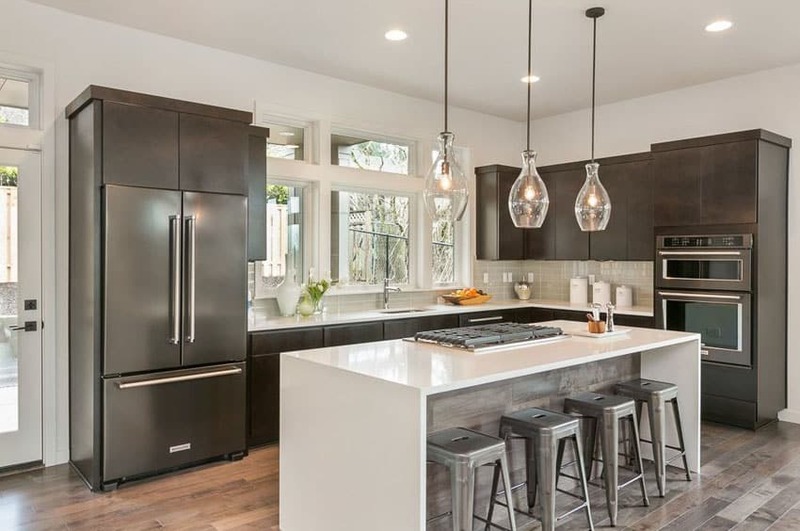 The small kitchen ideas shown in this classic design are composed of paneled solid wood cabinets in dark mahogany paired with a unique cream-black granite countertop. 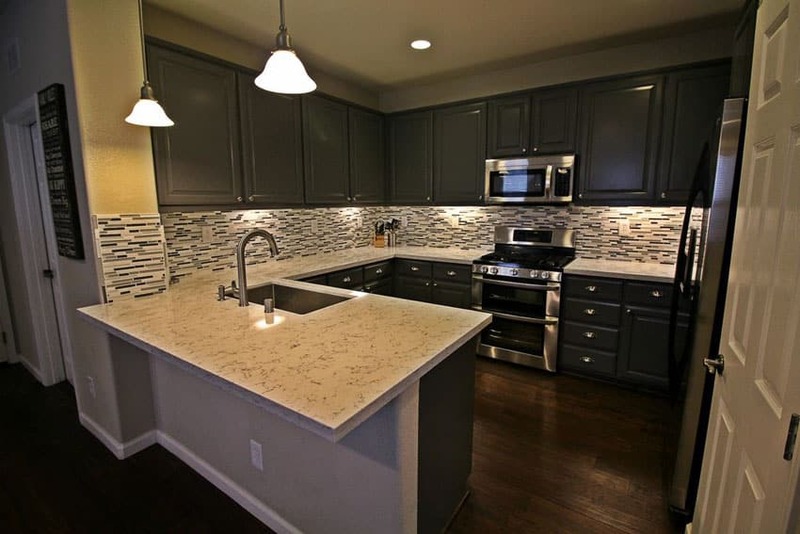 The light color of the counters adds a nice yet subtle contrast to the dark cabinets. The cabinets stands out nicely against the light beige walls, and matches with other built-in furniture and the rich hardwood flooring. An attractive drum shade chandelier looks elegant suspended above the kitchen island. Taking a new approach on updating classic kitchens, this example uses radiant colors to give the space more personality and an upgrade on style. 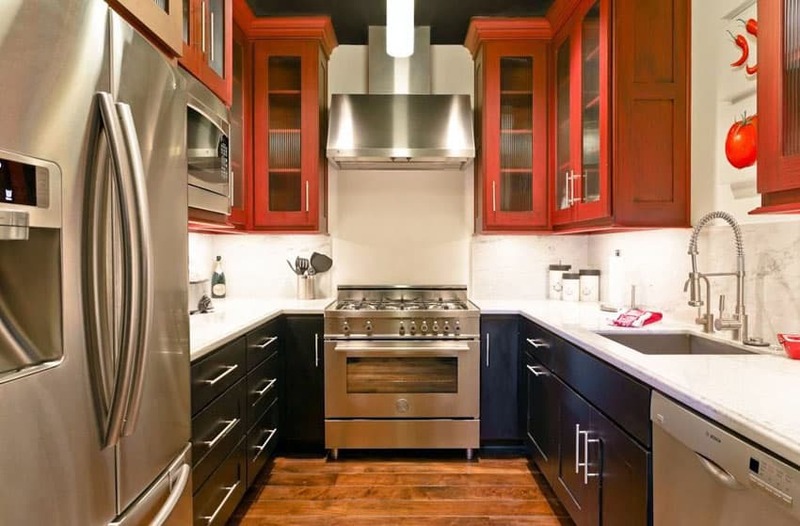 Combining dark wengue cabinet base with red-stained overhead cabinets, the rust is a unique color-blocked look. 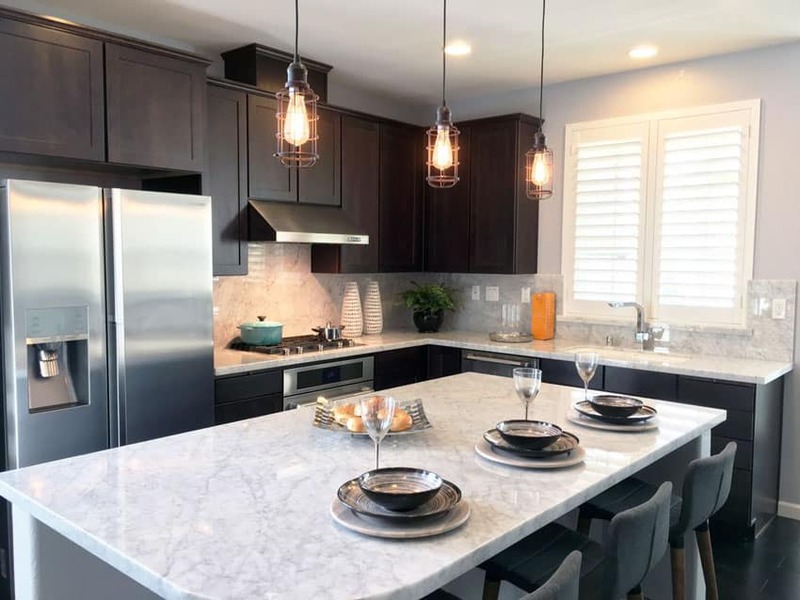 Despite the two bold and dark colors, the white granite marble countertop and backsplash provides a nice neutral transition between the two finishes, balancing the whole look of the kitchen. It is safe to say that all-white kitchens easily blends into an interior, no matter what style the rest of the interiors adapts. 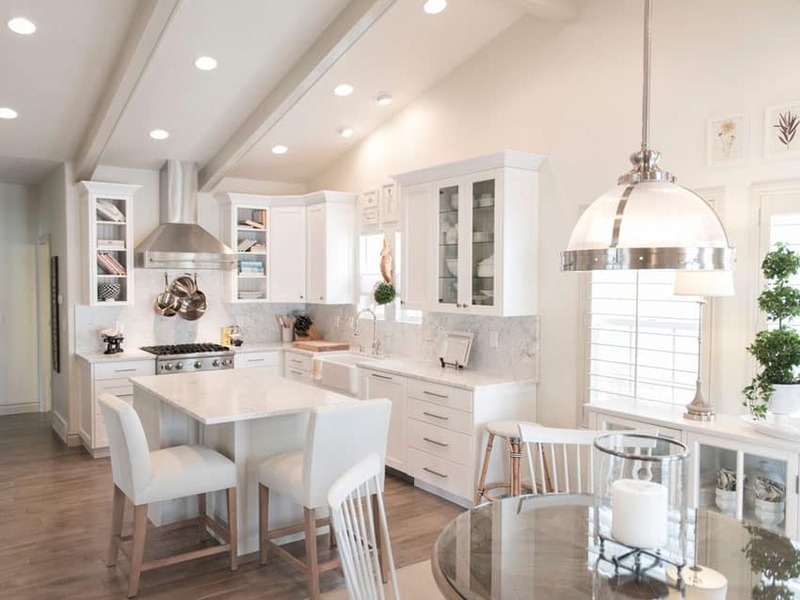 White finish makes it very versatile, even if the rest of the house’s color scheme change, and therefore has more longevity in terms of stylishness. 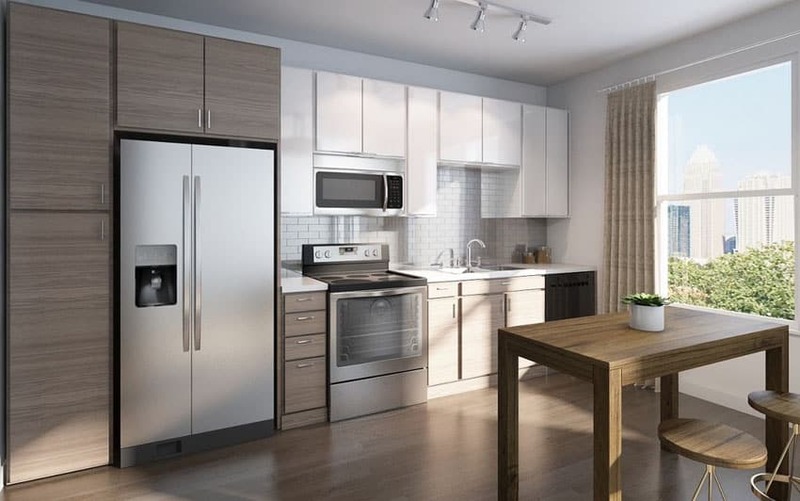 This one is a nice example of a simple white kitchen placed on light gray walls and ash wood flooring. The white brightens up the dullness of the gray surfaces and creates a very clean modern look despite the paneled design. 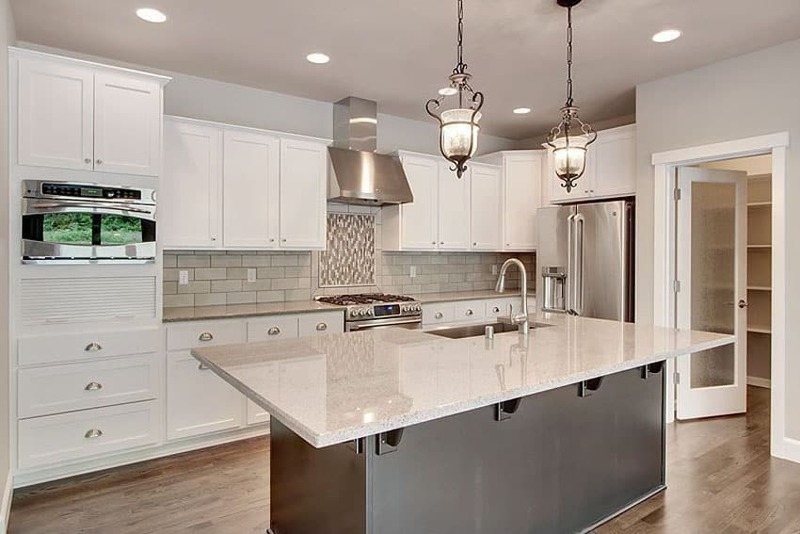 White quartz is the choice for its countertop to give it a little sparkle, while the backsplash simply uses glass tiles in gray which almost matches the gray color of the walls. This kitchen might be small and simple but it really looks stylish and cohesively blends into the rest of the design of the house. White walls with light walnut floors and ceiling planks set the background for this kitchen. The cabinets are simple paneled style painted in white and topped with elegant white marble. 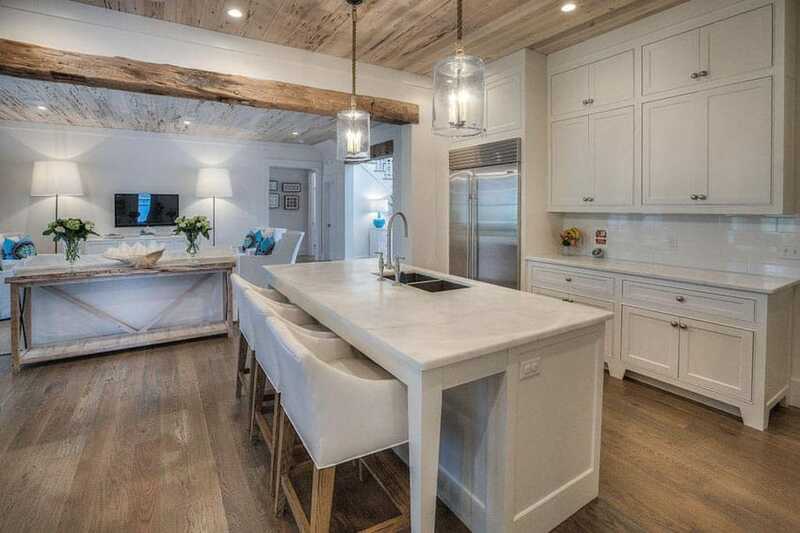 It has a small kitchen island with a built-in sink, a bar counter with upholster barstools and 2 pendant chandeliers suspended by rope to match with the rustic look of the house. Another modular kitchen design with a very simple straight layout. 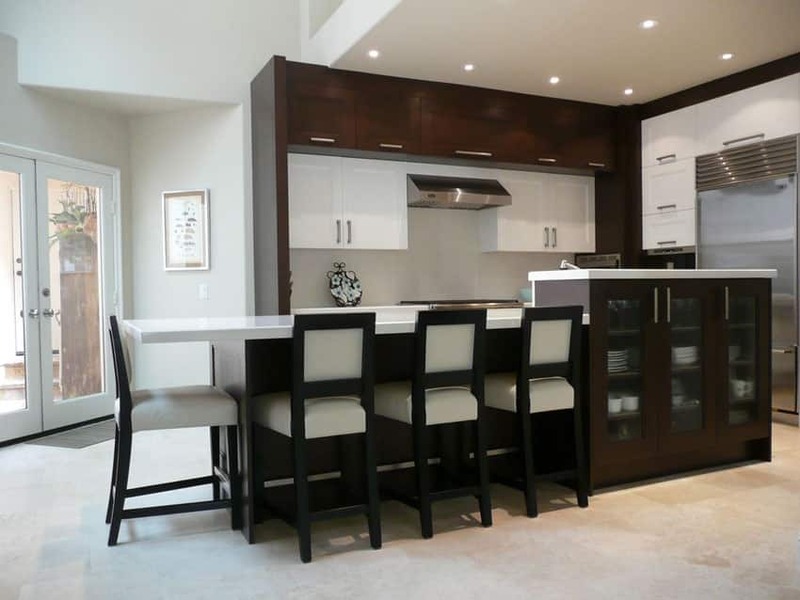 This kitchen combines two finishes – horizontally-grained light walnut laminates and plain white laminates. The plain white is used on the overhead cabinets, while the one in wood finish us used on the base cabinet and the pantry storage cabinet. 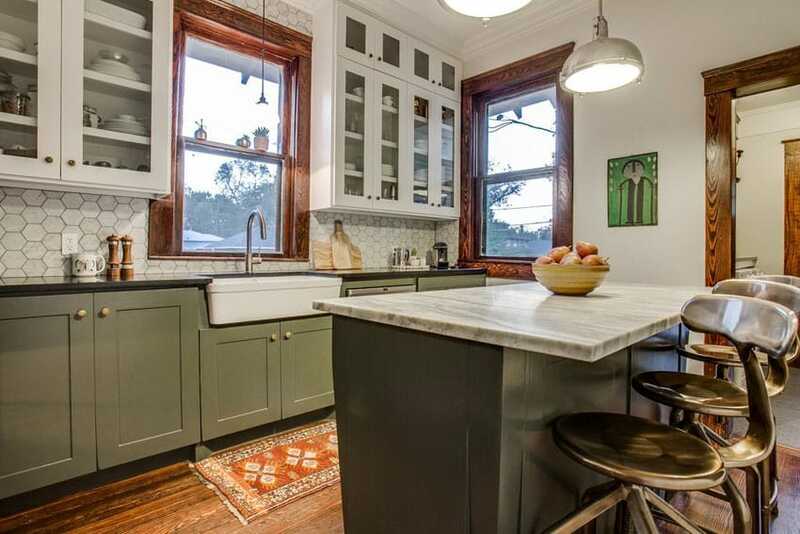 It uses classic white subway tiles for backsplash and white marble of the counter for an added subtle hint of pattern. Being the center of family gatherings, this kitchen takes center-stage in the layout, making it the converging point of different parts of the house. Despite the limited space it has, the space availableswas well-maximized to anticipate the number of simultaneous users of the space. It also uses a classic combination of gray, white and black to create a more timeless look. 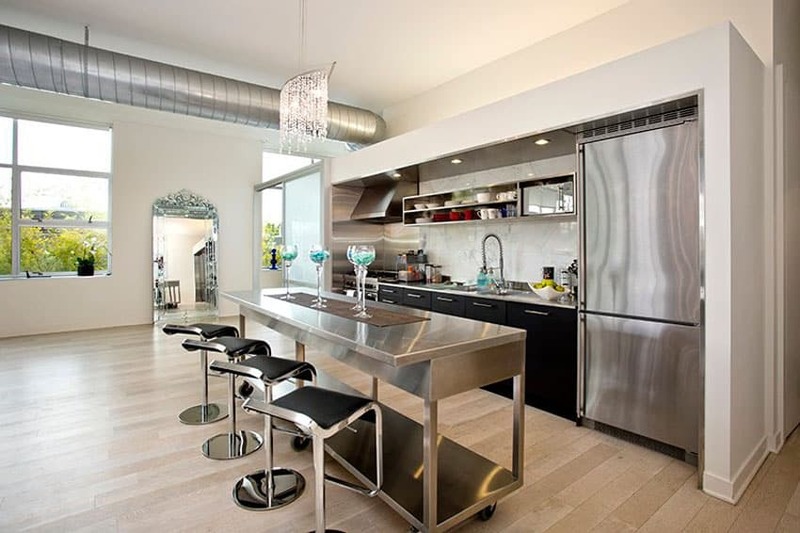 The height of the ceiling of this space was definitely maximized in this kitchen design. Overhead cabinets reach up to the ceiling, and divides the overhead cabinets into two door layers; the lower one is bigger, for items of immediate importance and the upper cabinets mostly intended for storage of rarely used items. For the finish, it uses dark Mahogany finish with prominent red undertones which gives a nice contrast to the cool-toned turquoise accent color of the space. Contrasts creates a bold effect, most especially when there are less variety of finishes. 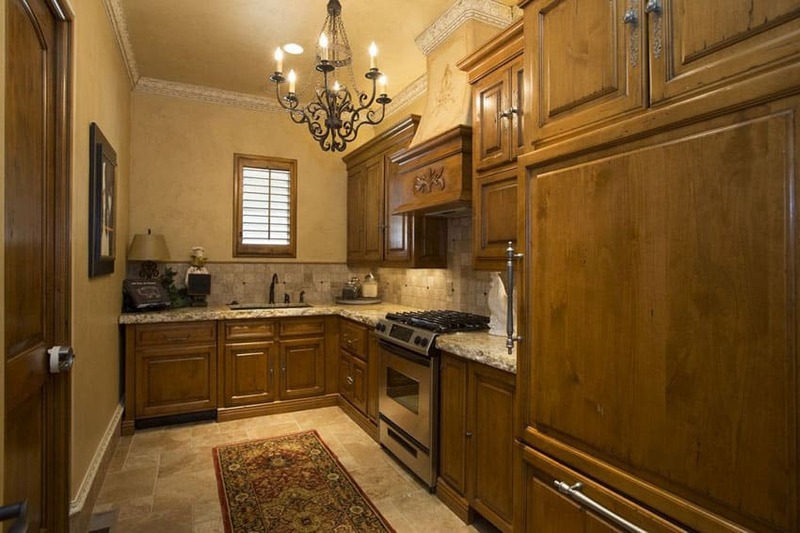 This is a good example of such, as it only uses 2 colors for the kitchen: mahogany and white. The result is a elegant and classic look, but given a more modern twist by the use of more modern materials and silhouettes. Full of small kitchen ideas and going for a rustic nautical look, this kitchen uses paneled kitchen cabinets and paints them over with a very soft shade of sage green, giving it a cool and refreshing look. Golden walnut floors on the other hand provide warmth and a more rustic ambiance to the space. For accessories, it uses striped fabrics and black wrought iron elements which are perfect for nautical style spaces. The beautiful window seat bench provides additional room to sit and helps give the room an inviting feel. Clean lines and simplicity of modern design, combined with the rustic appeal of natural fruitwood gives this small kitchen a unique look. Due to the limited space, one full wall was strategically dedicated for storage. 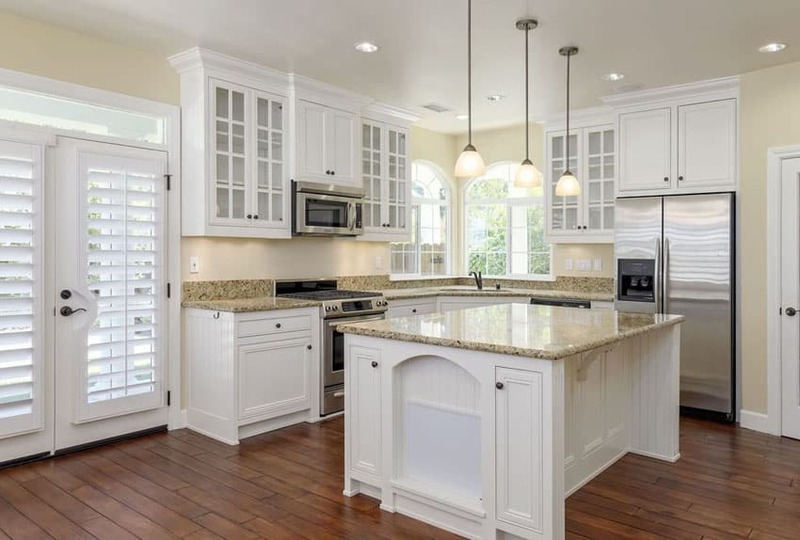 All kitchen cabinets have a simple paneled design and uses solid fruitwood to give tat natural warm color with lots of personality because of the natural grains and knots in the wood. 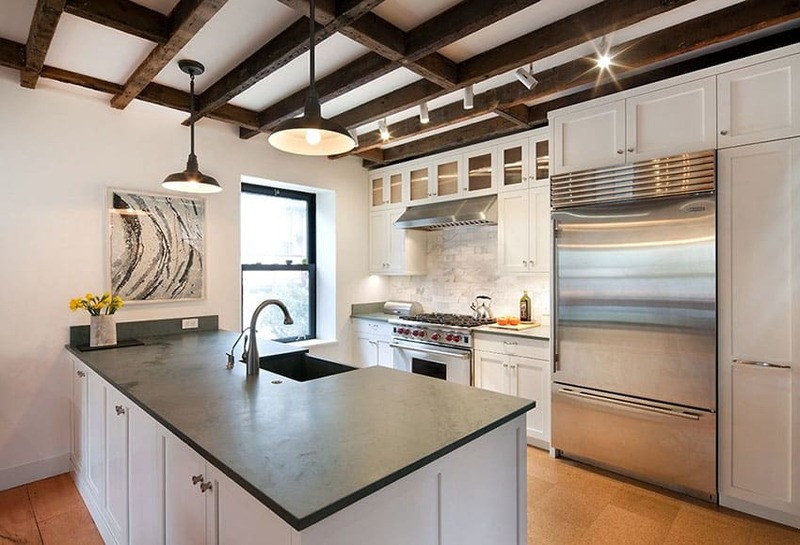 For a nice clean surface, marble was the material of choice for the countertop and backsplash. Being in a small living space doesn’t mean you have to go small in designing a functional kitchen area. 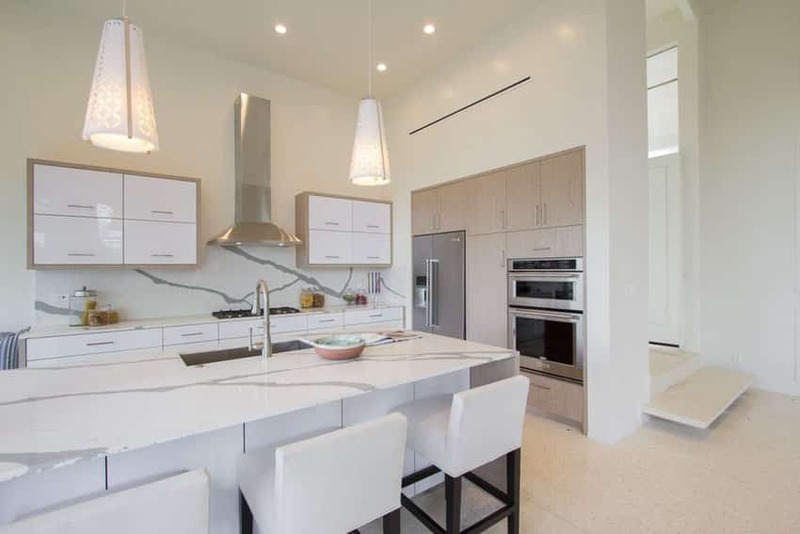 This contemporary kitchen with peninsula features a diamond white quartz countertop, matchstick tiled backsplash, light tone flat panel wood veneer cabinetry, light tone laminate floors, modern pendant lighting fixtures and stainless steel appliances. 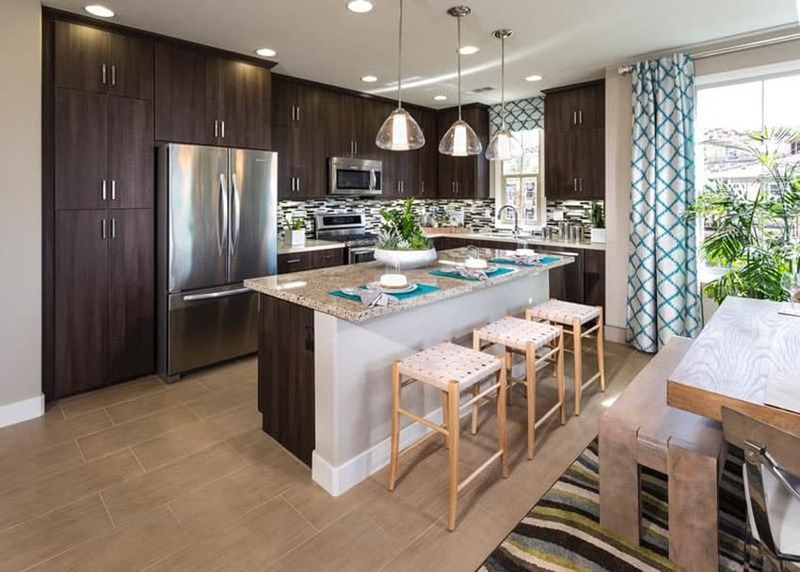 The peninsula provides more work space, extra storage and dining area.